The most recent forecast will always be more accurate. Often waiting a few hours until you get the latest forecast can make all the difference between a good decision and a bad decision. PredictWind shows you exactly when the forecasts will next be updated so you can make an informed decision on the confidence and accuracy of the forecast. How often is the forecast updated? A new forecast is generated every 12 hours. When is each forecast updated? With 4 different models and multiple resolutions the forecasts are updated at different times. In fact there is a 120min difference between the first and last forecasts updating. You should always wait until ALL forecasts are updated. The exact update times are shown in our FAQ here. Where can I see the forecast update times? Next update time is displayed below the forecast locations. Hover to see all forecast update times. See below forecast locations in main menu and on each individual forecast page. Tap to see all forecast update times. As the Offshore App is not designed to be connected to the internet, all update times are not available. However, after a download completes, the forecast update times are displayed for each download. 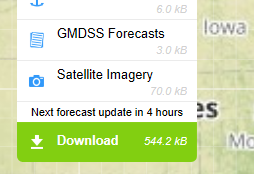 In addition, just above the Download button you will now see when all atmospheric forecasts are updated. Why are the wave models updated later? The wave models are driven by the wind forecasts from the atmospheric models, so the atmospheric forecast needs to be complete before the wave models can start running.